The Mathnasium model works. 65% of new prospects who walk into a learning center end up converting into customers. This advantage is unheard of in the world of digital marketing, where the average conversion rate on an e-commerce website is between 2%-3%. This simply means we need to drive the right people into your centers and the Mathnasium Method and Story, coupled with national brand recognition sell themselves. Let’s say a web visitor searches for a math tutor and ends up on your learning center portal – that would theoretically be great, right? But what if that visitor was located 75 miles away? He would most likely not become a client, and you just wasted about $4 on that click. Another example; Let’s say a web user searched for “Math Homework Help Cheat Sheet” that click may also end up on your website, while the user was simply looking for some type of homework help. Let’s ask a rhetorical question: What would be a better single web visitor – a Mom looking for math tutors for her 5th grade child at $20 per click, or 20 visitors at $1 per click who simply won’t convert? In the same way that a storefront attracts car and foot traffic, a good web presence can do the same for online visitors. 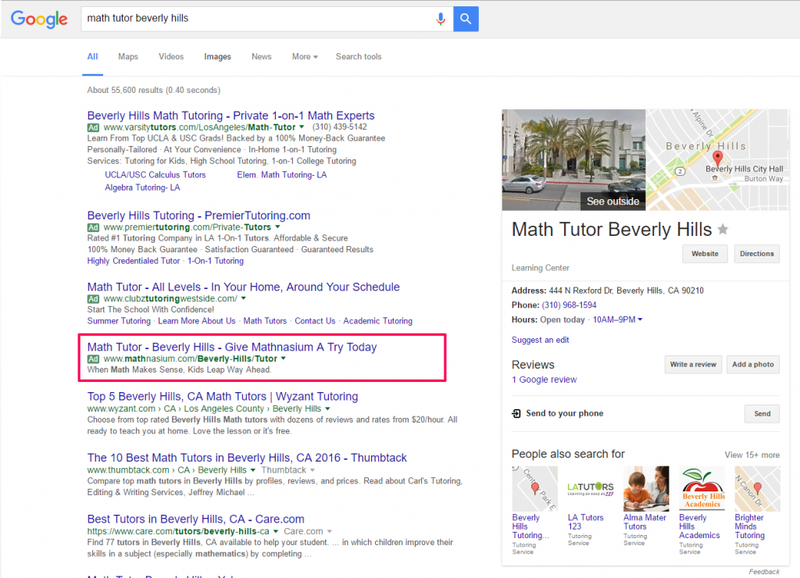 Here’s an example for a web user searching for a “Math Tutor Beverly Hills” with two types of results; which is more likely to get clicked on? PPC – It Pays to be local! As you would imagine, the ad that mentions the city name in the title of the ad has a click-through-rate of over 8% vs 1.09%. A 733% increase in CTR! Tip #1 – Always use both the city name and Mathnsaium in your ad! 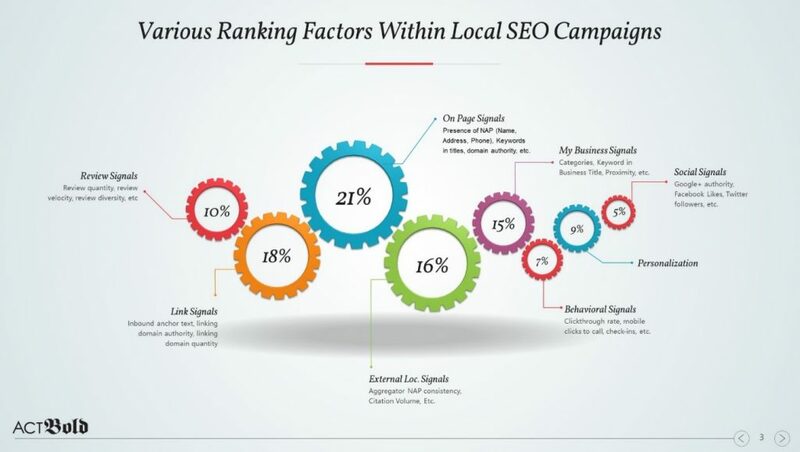 The diagram shows the various factors that affect a locations’ SEO presence. Over 50% of those factors are related to having consistent NAP (Name, Address, Phone) information across multiple citations. Citation are websites that reference your local business’s name, address and phone number (even if they don’t link to them); sites like a Yellow Pages or a local chamber of commerce listing. Citations are among the KEY factors for ranking organically on Google and Bing – they validate that a business is actually the real thing and is part of the local community it is trying to rank for. As we mentioned at the start of this article: the single greatest advantage of digital marketing is the transparency in dollars spent with a near perfect ability to track ROI. All digital marketers should know what a lead is worth to them in terms of $ value, and measure the Cost-Per-Lead vs Lead Value. Tip # 3 – Know what a lead is worth and make sure lead tracking is in place for all digital marketing campaigns. The Above report is a sample PPC report that provides the necessary information. As we mentioned, properly running localized campaigns has a big advantage over national campaigns. Campaigns that are built out and managed correctly have a much higher relevancy score with Google led by a higher Click-Through-Rate (CTR) and more relevant ad copy. However, localized campaigns are also in danger of wasted ad spend by targeting the wrong group of people who might visit the Center website, but then convert on a different center’s page because the geo-targeting wasn’t built out correctly. 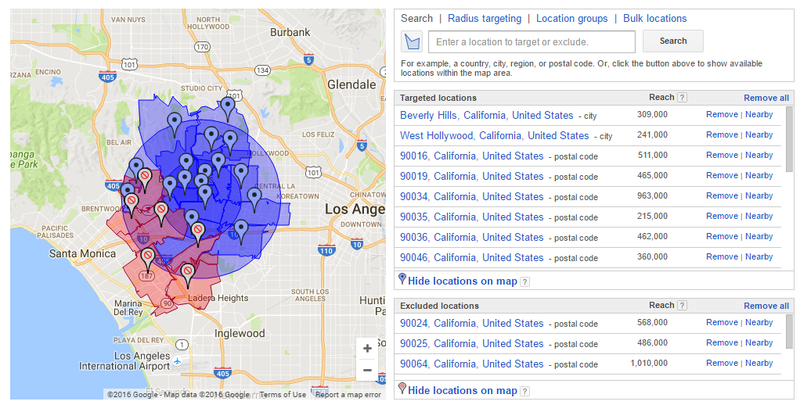 The Blue sections show the exact locations this Center should target and also excludes specific regions close to Beverly Hills that have other Mathnasium Centers in it to prevent wasted ad spend. The Beverly Hills center’s ad should NOT show up in this case, although she resides in Beverly Hills. This is done by creating an effective negative keyword list (as sees in the image below) that includes local city names that are closer to other centers. Tip #5 – Always use geo-targeting and negative keywords to hyper-target your web visitors. 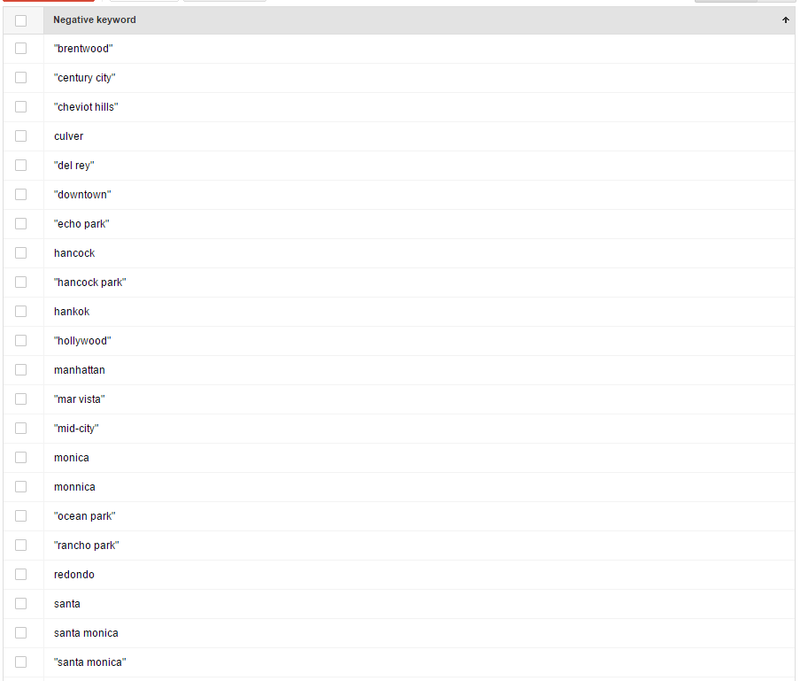 Bing Ads allow users to adjust bids based on MSN users’ gender and age – a huge advantage to local Mathnasium Centers. Account Set Up and Maintenance is fairly similar to Google – with a few user interface differences. In short – Bing might be the perfect outlet to grow lead volume at a lower price per lead than Google. The above tips should be a great start to acquiring more online leads that translate into in-store customers. 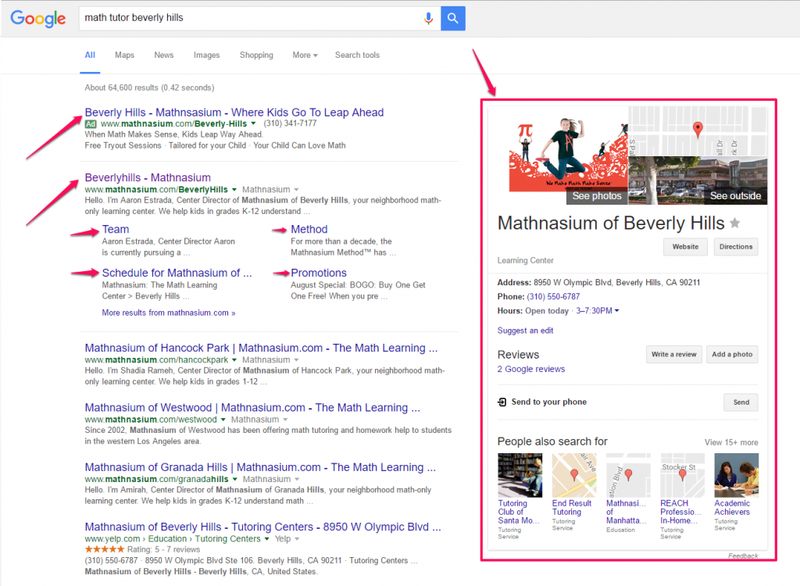 As mentioned above – every Mathnasium is set up to succeed as long as the right online visitors are targeted and tracked.